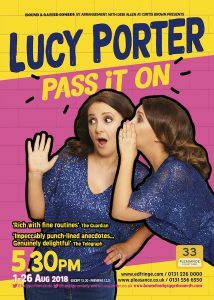 Lucy has been a huge hit with comedy audiences up and down the country for over ten years with her distinctive, bouncy, feel-good comedy. She has continued to travel internationally with her stand-up – taking in the Far East & including shows in Hong Kong, Bangkok, Macau, Manila, Switzerland and Paris. She was also invited to Miami to take part in NBC’s Last Comic Standing and has performed in the States for NBC and HBO at their Las Vegas Comedy Festival. She’s also regularly invited to festivals closer to home including Manchester, Glasgow and the prestigious Kilkenny festival, as well as other mud-soaked scrums such as Latitude. During 2014 Lucy returned to the Edinburgh Fringe with her 10th solo show, Me Time which toured in the Spring. She also turned her hand this year to playwrighting with a thought-provoking, witty play, The Fair Intellectual Club. Put on at the Assembly Rooms in Edinburgh during the Fringe, her creation explores the trials of being an intelligent woman in 1717 Edinburgh. Following the success of the Edinburgh run, BBC Radio 4 commissioned a 6 part drama series from Lucy based on the play. She is currently writing it for transmission in 2016. Lucy is a regular face and voice on TV and radio panel shows and is a glutton for a good quiz show. You may have seen her alongside Ed Byrne providing pointless answer after pointless answer on a Celeb special of BBC 1’s Pointless, or seen her emerge victorious from a well-fought battle for the title of Celebrity Mastermind Champion in a Children In Need special. Lucy fended off stiff competition from Mark Watson and Dave Spikey and broke records by achieving the highest ever celebrity score. She has also appeared on two series of IQ, two series of Mock the Week, two series of Argumental, Have I Got News for You, Clive Anderson’s Chat Room, Never Mind the Buzzcocks and What the Dickens?. On Radio 4, she has been heard on Life – An Idiot’s Guide, Heresy, The Personality Test, The News Quiz, Dilemma and The Unbelievable Truth, and is a regular guest on BBC 6Music on The Radcliffe & Maconie Show. She remains amongst the most sought-after comedy writers in Britain and was one of the lead writers on ITV1’s prime-time Sunday night satirical animation series Headcases. Lucy has also moved into the world of film and she (along with Green Wing writers Fay Rusling and Oriane Messina) has a feature script (working title Queen of Comedy) on the development slate at leading Brit film company Warp X.
Lucy is also a popular voiceover artist. Recently Lucy has contributed to various publications as a columnist, including City AM, Cook Vegetarian Magazine and Mother & Baby. Sign up for Lucy's mailing list by entering your details in here, we'll never share your details with anyone ever, and only email you updates from Lucy herself.